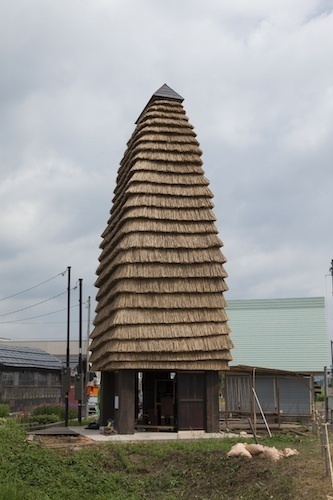 MIKAN + Sogabe Lab, Gejo Thatch Tower, 2012, Tokamachi-city, Niigata Prefecture. A year and a half after the Tohoku earthquake in Japan, art director Fram Kitagawa’s vision of an art treasure hunt set in the bucolic but run-down villages, rice fields, mountains, and river valleys of this remote northern province is more relevant that ever. The Echigo-Tsumari Art Triennale looks to create a new meaning for the practice of art installation, one capable of revitalizing the backwaters of Japan’s perpetually postbubble, postdisaster society. In this, the triennial’s fifth iteration, spread out over four hundred and fifty square miles, some three hundred participating artists and groups have transformed more than forty abandoned houses as well as dozens of deserted schools, factories, and agricultural sites. The most interesting new installations here are architectural. Two quirky Tokyo firms, Mikan and Atelier Bow Wow, have each constructed three-dimensional additions to obscure village rail stations, creating low-budget art spaces that mischievously play with miniaturized scale and local construction materials. Likewise, inside a cavernous empty school from the 1970s, Tadashi Kawamata has built what looks like a wooden tower of Babel; the structure acts as a library for the art book collection of art critic Yusuke Nakahara, donated posthumously by his family. And, in another village, Tsuyoshi Ozawa and a group of his students from Tokyo University of the Arts (Geidai) who call themselves the Committee for the Reproduction of the Tea House Oil Painting Gallery have installed a vaudeville, tongue-in-cheek reconstruction of the entertainment side show at Asakusa’s Senso-ji shrine in Tokyo, which allegedly introduced Western oil painting to Japan in 1874. Such works are but a taster of what is quite deliberately an impossible triennial to visit in its entirety. The logistics force viewers to slow down to rural pace, compromise their checklist plans, and instead enjoy the scenery, local food, and chance encounters. The point of the art here is less the content of specific works and more the extraordinary art experience it occasions: an emotional reconnection with Kitagawa’s core concept of satoyama, the feel of Japan’s mythical landscape, between cultivated rice plains and uninhabitable mountains. Echigo-Tsumari forces artists and audiences alike to engage with the land and its buildings, and to meet, interact, and cooperate with an aging population that includes few children. The visitors must face up to a bitter sense of decline after economic boom times. This is site-specific, social, and relational art in its purest form.